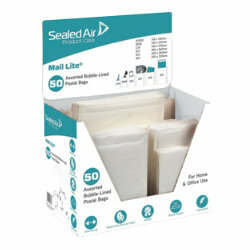 Mail Lite Bubble Bags 100214806. Size: Assorted. Material: Paper. Colour: White. Quantity: 50 pieces. Jiffy Padded Bags MJIB01003. Details: Heavyweight protection. Details: 65% recycled. Colour: Brown. Quantity: 200 pieces. Jiffy Padded Bags MJIB01014. Details: Heavyweight protection. Dimensions: 336 x 489 mm. Size: 7. Colour: Brown. Quantity: 100 pieces.